Considering doggie daycare? Is Buster bouncing off the wall when you get home from work? Does Molly have separation anxiety? Then doggie daycare may be the perfect solution. Dog daycare works much like daycare for children. You drop your dog off in the morning on the way to work and pick him or her up later in the day. At daycare your four-legged friend can play a game of fetch, gnaw on a toy or just hang out in the “living room” and watch TV. Dogs are social creatures. They benefit from being able to interact with other dogs and people. You feel better knowing your dog is being entertained and getting some exercise. Many dog daycare facilities also sell products, offer grooming, boarding, taxi services, pet sitting, etc. There are many things to consider when choosing a doggie day care facility. A good daycare facility should be affordable, convenient, offer a secure clean environment and have an adequate number of well-trained staff. Here are some questions to ask when comparing facilities before making a decision. Are the dogs indoors or outside most of the time? If they are outside is there adequate shelter in the case of bad weather? How secure are the play areas? Many facilities offer double gates to prevent escape when someone is entering or leaving the play area. Are there separate areas for different sized dogs? 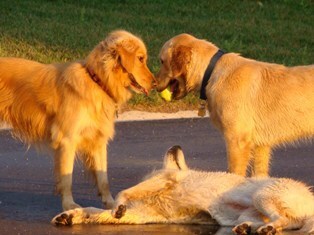 Dogs do best when they are around other dogs of similar size and energy level. What is the staff to dog ratio? You want to be sure there are an adequate number of people to supervise the dogs. One staff member for every 10-12 dogs is optimal. What type of training do staff members receive? Are they trained in basic obedience, pet first aid, dog behavior? Is there a time out area when a dog needs to be separated from others? Is there a veterinarian on call should an emergency arise and how are emergencies handled? All good facilities have a screening process in place. The screening process usually includes an interview with the dog owner and observation of the dog in varied situations to assess for aggression, shyness or fear. Daycare is not for all dogs. Older dogs may find all the commotion and play overwhelming. Shy dogs may be overwhelmed by the crowd. Aggressive dogs will not usually be accepted at doggie daycare. Most facilities will only allow dogs that have been spayed or neutered as non-altered dogs tend to be more aggressive and females in heat can cause fights between male dogs. The staff at a good facility will also want to make sure your dog is healthy and up to date on vaccinations and preventatives such as heartworm medication.